Babar is a classic cartoon that is based on the children's books by Jean and Laurent de Brunhoff. Since 1931 Babar has been entertaining young children. And recently the shows have been digitally restored and remastered on DVD. I was sent Babar School Days & Babar Best Friends Forever DVD's to review. 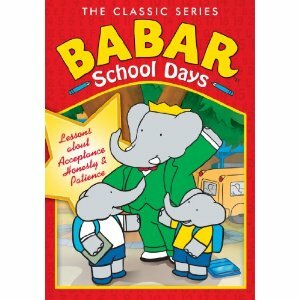 The first episode is called School Days and it follows Babar on his first days of school. 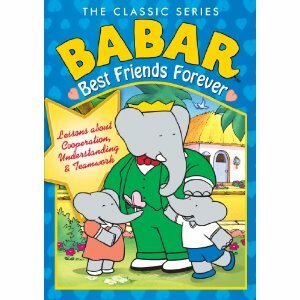 In the episode Babar is bullied because he has a trunk. Many of the students in the show are bullied by the same boys. Each character finds a way to hide what makes the boys bully them, but its not so easy for Babar to hide his trunk. Bullying is a big problem with young children and I like that this episode dives into the subject. In City Ways, Babar learns to adjust to life in the city with the help of the Old Lady. In Between Friends Babar recalls the time his wife and friend had an accident and had to go to court. In Friendly Agreement there is a major disagreement between Cornelius and Pompadour. They vow they will never speak to each other ever again, but they do. In An Elephant’s Best Friend Babar is excited when he finds a pet warthog in the jungle. After finding out it belongs to Lady Rataxes he sadly returns it. Babar takes on some difficult subjects and helps to bring resolutions. Both DVD's share some great lessons as children are entertained. I like it when a show also teaches. I prefer if Jayden is going to watch television that at least the show has some value. The Babar DVD's both have great value and teach lots of values also. While watching these Jayden sat very still and just watched. He was very intent while watching. We sat together and Jayden would make some comments about what was going on in the show. I was provided both DVDs to help in my review. I was not compensated in any way. All thoughts and opinions are my own and not influenced by anyone. My little ones LOVE Babar! My son runs around trying to blow his breath like an elephant sounds.